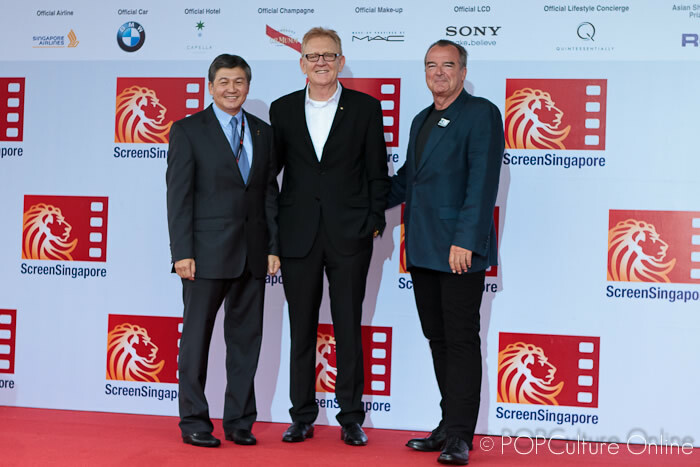 Screen Singapore is an international cinema event which debuted on Sunday, the 5th of June. 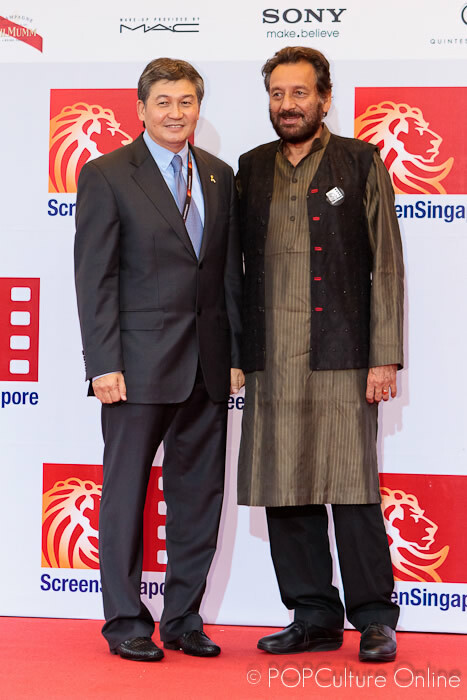 It offers a week long worth of activities which includes press conferences and red carpet gala premieres of various international movies with stars gracing the event. 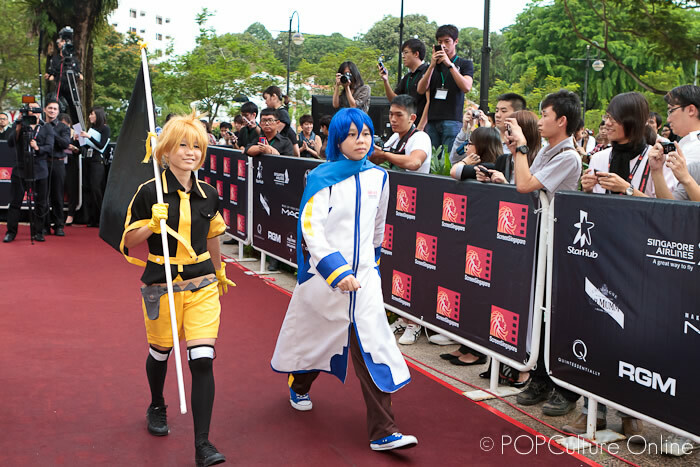 One market not to be miss was the Japanese popular culture which has it's very own red carpet gala premiere. 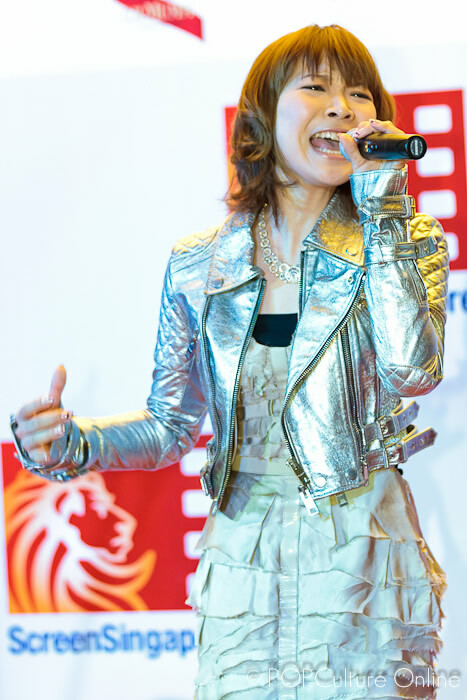 Japanese Night, saw the premieres of both Paradise Kiss, a Warner Bro's live adaptation of the popular manga series by Ai Yazawa and May'n The Movie -Phonic Nation-. 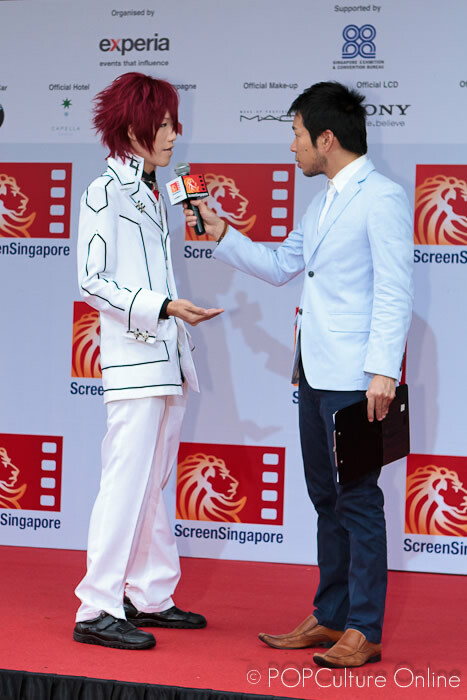 Actress Aya Omasa who plays Miwako Sakurada in Paradise Kiss and Japanese singing sensation May'n graced the red carpet to a very excited crowd. 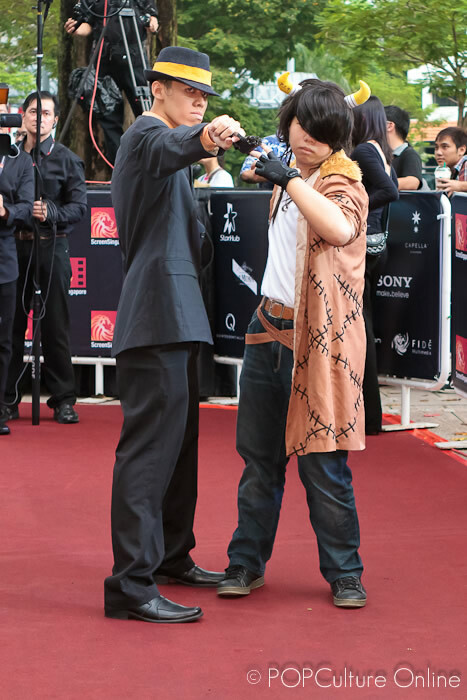 To add a touch of Japanese popular culture to the event were our local cosplayers who turned up in cosplaying various characters from different series. 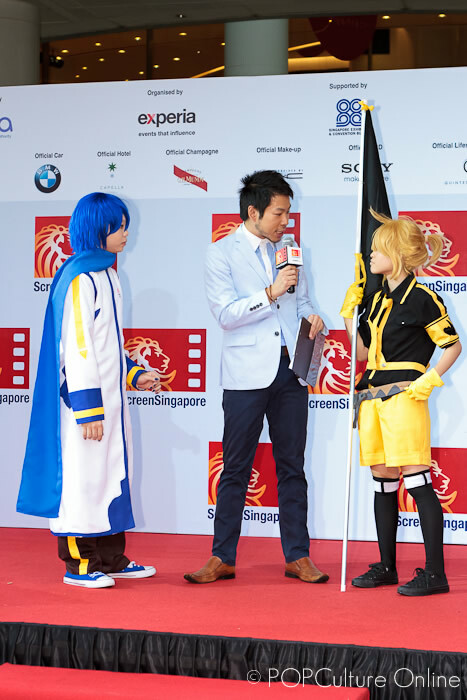 From the mainstream Naruto Shippuden series to the popular Katekyo Hitman Reborn! 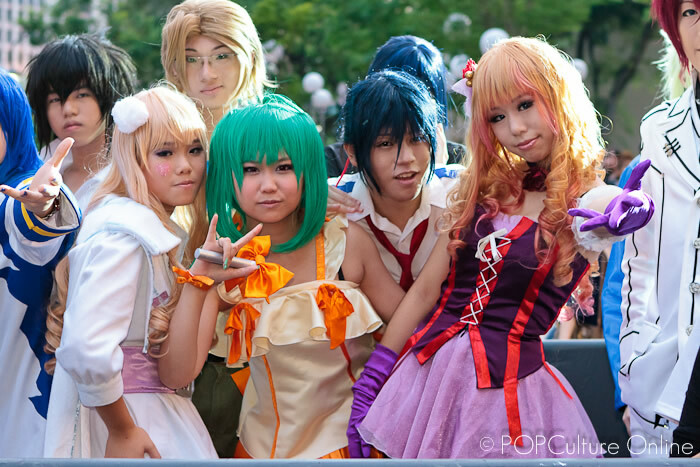 and Vocaloid series, the cosplayers definitely added a nice touch of colour as well. 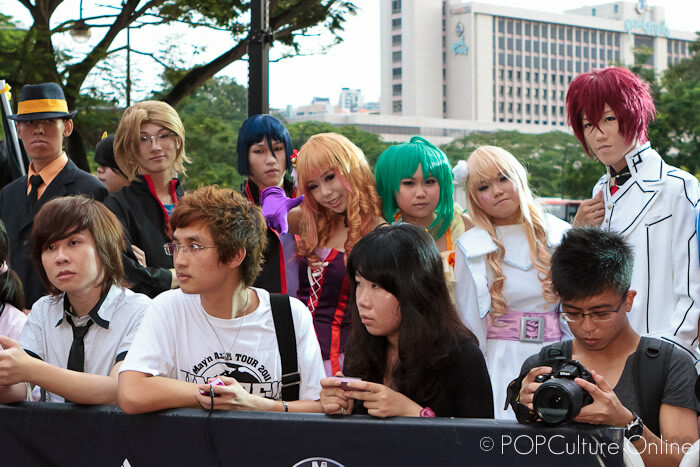 Everyone who is into the anime universe knows, May'n who is the singing voice of Sheryl Nome from the Macross Frontier series and with her being the main attraction to walk the red carpet that night, it was not surprising to see so many cosplayers doing characters from the Macross Frontier series. 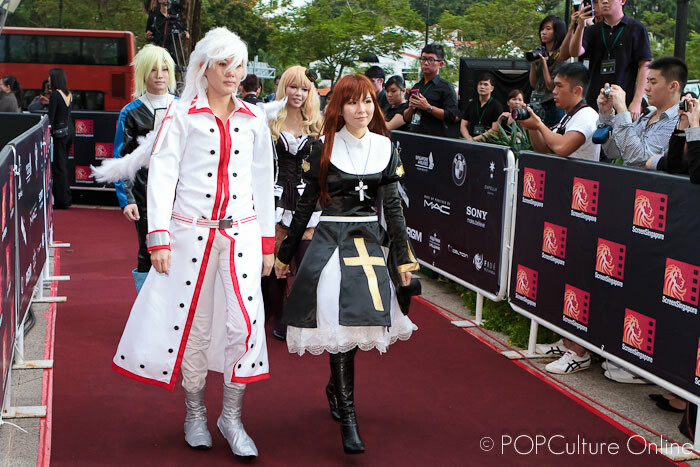 POPCulture Online also understands from one of the cosplayers that hearing May'n sing Diamond Crevasse was the reason he was inspired to cosplay the series. Talk about being influential! 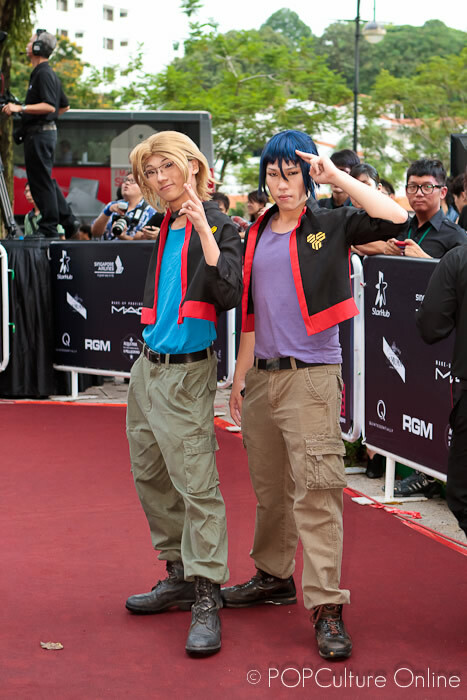 Another noteworthy pair of cosplayers are these two portraying characters from the Defence Devil series. 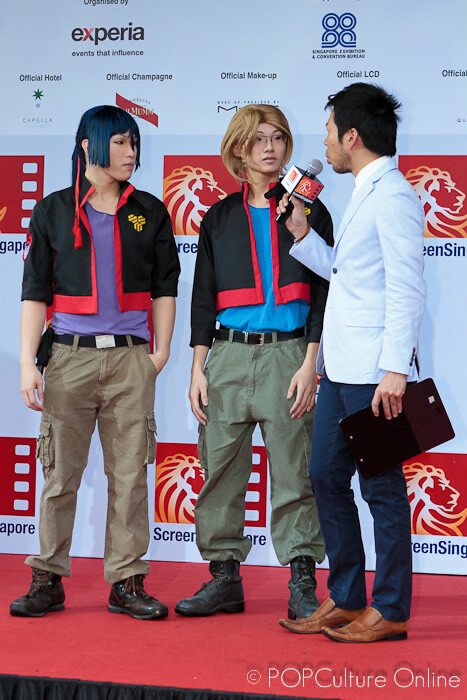 If you find them familiar, that is because they are the Singapore Team which came in 3rd in last year's Regional Cosplay Competition held at AFAX (Anime Festival Asia X). 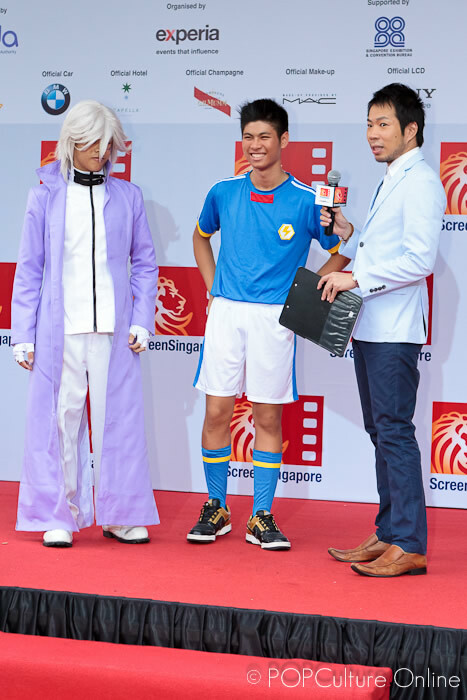 By then the cosplayers had done their part in warming up the crowd and the various VIPs as well such as members from the board of ScreenSingapore made their way down. This pretty much signified the eagarly anticipated arrival of May'n which really got the crowd going. 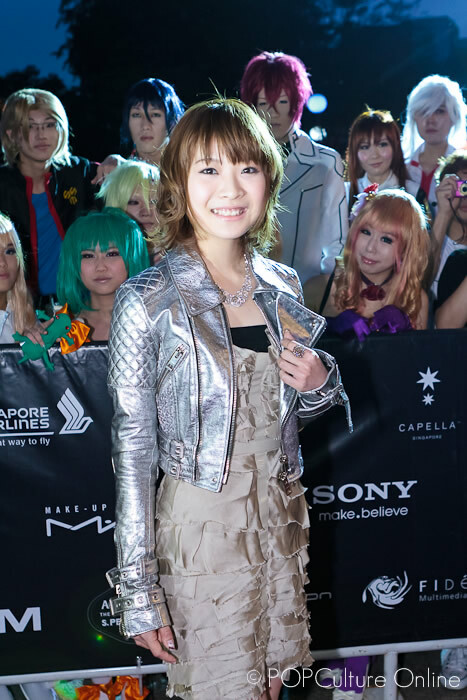 First of the two Japanese Guests to arrive was Aya Omasa in a classy evening dress with jewelery by Chopard. 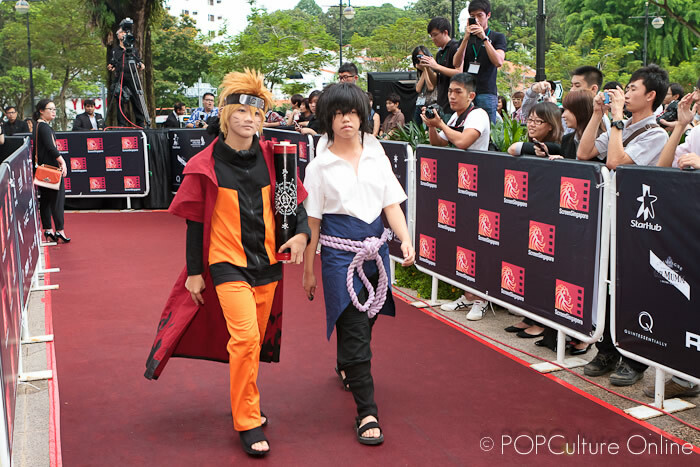 The 20 year old actress definitely wowed everyone (including POPCulture Online's photographer who nearly forgot to press the shutter button) with her beauty and smile as she walked down the red carpet. 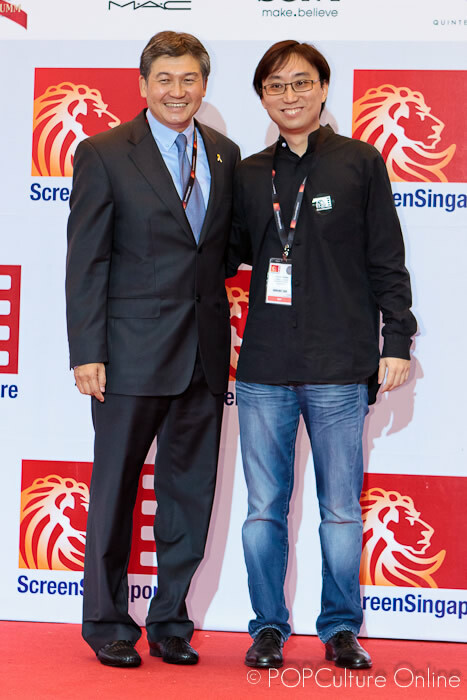 The host of the night, Chua Enlai knew how much the fans wanted to see May'n and he kept the crowd cheering and proclaiming how big fans they were as they waited for May'n to make her arrival. And finally the moment of truth as the gorgeous singing sensation made her way down the red carpet to an adoring crowd all fired up and the fans who turned up in her Unite!! tour tee shirts cheering. 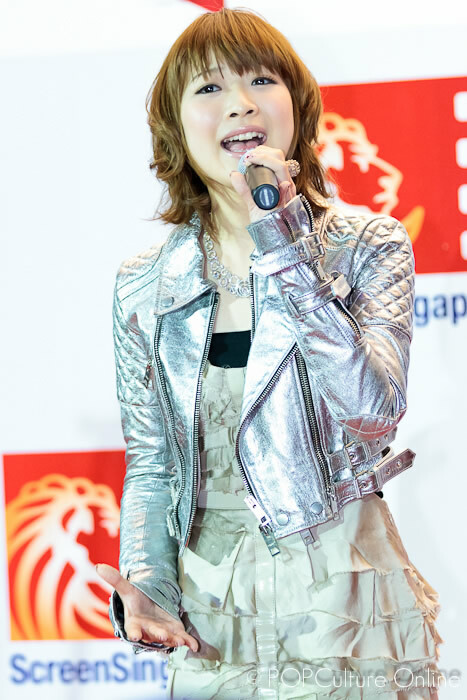 Not to disappoint, she wore a stunning outfit styled by British luxury fashion house, Burberry. As a treat to everyone present, she gave a live performance of Diamond Crevasse, the song that she mentioned in her movie that really started everything, followed by Phonic Nation, a song which described how she felt about uniting everyone under the same sky with music. The fans definitely enjoyed performance and showed their appreciation with lightsticks coming out and moving in unison to the mood of the song. Even though this marked just the start of the gala premiere of her movie, it represented everything her movie is about and it shows that one voice can unite the world with music. 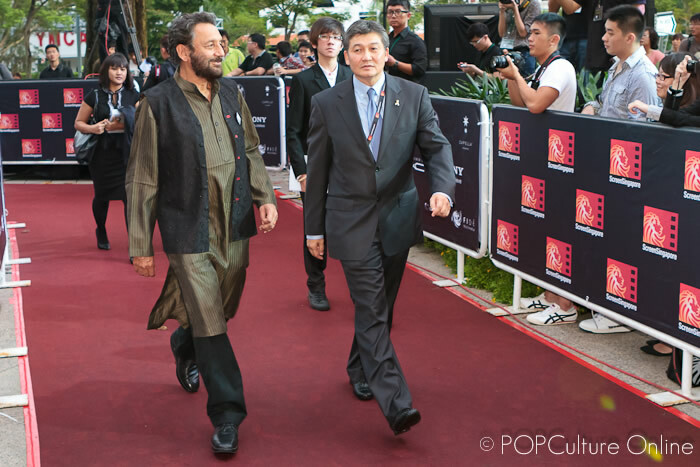 Watch out for POPCulture Online's review of May'n The Movie -Phonic Nation-.